On my Twitter feed I recently came across a post about a new urban development concept called “SuperDensity” crafted by the international design practice HASSELL. Introduced by HASSELL Principal David Tickle at the 2016 Council for Tall Buildings and Urban Habitat International Conference in China this past October, SuperDensity is described as a “three-dimensional systems of open space, transport and resource utilization, inspired by the systems of the existing city”. Having not attended the CTBUH talk and only seen a few provocative renderings of lush towers rising out of the Hong Kong skyline, I wanted to learn more about this proposal. David was a nice enough to answer a few questions for us and elaborate on the ideas that led to SuperDensity. Adam Mayer (AM): What is Superdensity? Is it an existing condition of cities or a new design methodology? David Tickle (DT): SuperDensity is a completely new urban concept. With growing urban populations around the world, increasing density is something urban designers spend a lot of time thinking about. 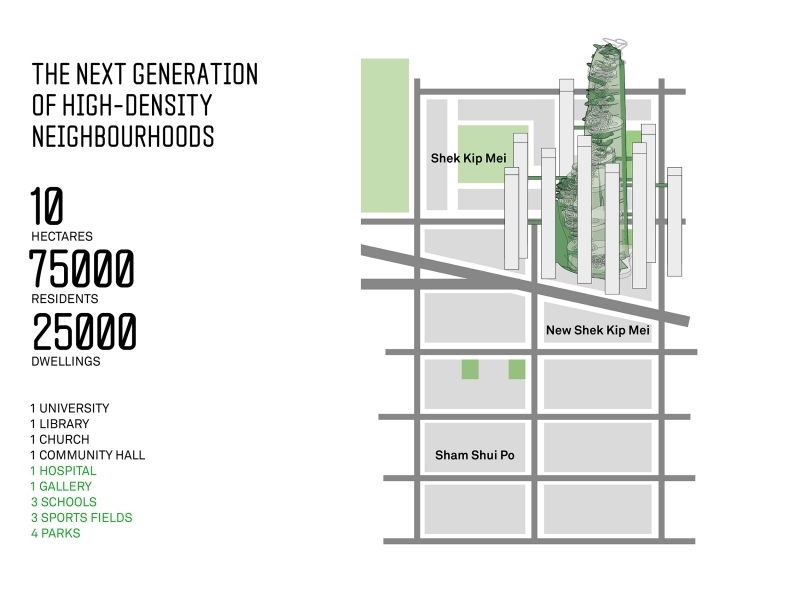 The idea for SuperDensity stemmed from our consideration of the potential for a city that is already dense – like Hong Kong – to become even more dense, without compromising social or environmental outcomes. We looked at the physical, social and environmental dimensions that constrain a city’s future growth, and the different ways of measuring density and we concluded (along with input from engineering firm WSP) that the solution could be ‘vertical streets’ – an innovative vertical system of public spaces, transport and infrastructure that would provide all the amenity usually found on the horizontal plane . Our proposal starts with a continuous ramp – a public, accessible, flexible pathway that is 10 kilometers long and winds its way 500 meters into the sky. We then augment this slow path with a faster option – a rapid transport mode that stops every 80-100 meters. 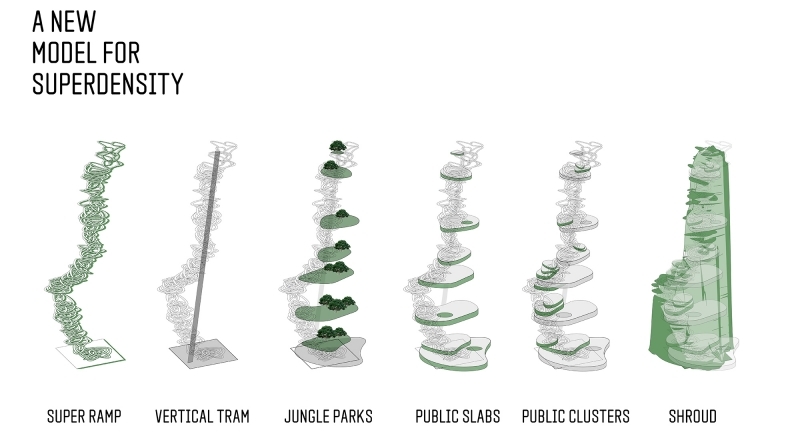 At each stop, we propose new jungle parks and public slabs containing hospitals, libraries, schools, markets – the social infrastructure required for living and working populations. And along the ramp, clusters of economic activity, retail, workplace and enterprise centers – like a vertical version of street-facing shopfronts. We have now essentially created the idea of the vertical main street, with fast and slow movement, open spaces, and social, economic and ecological infrastructure. This “street” is then the catalyst for the renewal of the surrounding neighborhood, with new residential and commercial towers plugging into the SuperDensity tower. AM: What are the advantages/disadvantages of SuperDensity? DT: Before we started, we had already recognized that the traditional approach of engineering taller, thinner, building structures and reducing the area available for public space and public infrastructure doesn’t deliver the ‘social license’ for density. Yes, we make more buildings and more dwellings, but we do not necessarily provide the homes people want. Our starting point was that the ‘people factor’ is key to achieving greater density in cities. So SuperDensity is all about what some people talk about as “density done well”. We weren’t interested in designing disadvantage. AM: Are there any examples of SuperDensity today? In what capacity is HASSELL currently applying strategies of SuperDensity to cities? DT: We developed the SuperDensity concept as part of our constant efforts at HASSELL to try to be ahead of the curve. As urban populations continue to grow, we need to be smart about how we accommodate them, and to be prepared to challenge traditional thinking. No, there are no examples of SuperDensity right now, but in the face of growing urban populations, it’s conceivable that it’s a solution that we might look to in the not-too-distant future. AM: Are there certain geographic markets (e.g. developing cities in Asia) that are more receptive to the idea of SuperDensity? What about the United States where, aside from some high profile cities, is primarily made up of low-density sprawl? DT: SuperDensity is a concept that could help better accommodate growing urban populations in cities around the world. It’s certainly not just a Hong Kong or Asian solution, although these cities are generally more open to innovative systems of movement, connectivity and space. And we also believe it is a scale-able idea: that the thinking behind it could apply to both lower and higher density contexts, and therefore, a whole range of different cities. AM: On a more technical level, how do SuperDense structures plug into the existing infrastructure of cities? Do they create their own infrastructure? DT: The answer is either or. SuperDensity can work when it has its own infrastructure, its own self-contained systems of transport, connectivity, sustainability, and, ultimately, we envisage it as creating self-sustaining neighborhoods that exploit the verticality of the city. But some connectivity is critical and SuperDensity can also be ‘retro-fitted’ to existing infrastructure, particularly underground transport systems. Many thanks to David Tickle and HASSELL for taking the time to answer our questions. If you have any additional questions about SuperDensity, please feel free to leave a comment to this post and we will have David get back to you. Hayden White - My concern, having seen this idea proliferate around the center for tall buildings and urban habitats and toy with it personally is that it might become too inclusive and not be resilient to failure. When we look at the steven holl linked hybrid in Beijing, where I now work as an urban design researcher, we can see (often) armed security surrounding the area that was designed to be ‘public space’. I also think back to corbusier’s unite dehabitation and how it did not take long for commercial activity to move out and shops became abandoned. In my own opinion this arose from a lack of commercial competition. I believe such towers could be very well designed but what is more challenging is the econometrics of how infrastructure and commerce would be sustained. Would the spaces be public? (for all!) or private. Any ambiguity would quickly be pounced upon by a developer. Would the ‘vertical street’ contain paid-for amenity or services (cinema/gym/shops?)? And how could these be sustained at reasonable cost. Of course, hoping here that the notion of Super Density is not restrained to the wealthy elite. My hunch is that this kind of tower could plug in to a vertical section like Kowloon Station in HK very well but would need paid-for amenities to remain near ground level to force competition and supplier resilience should a premises be vacated or close down. Thanks for taking the time to make these comments. You are absolutely right about public/private delineation … and it’s fundamental to our proposal. SuperDensity is primarily a public system, with the vertical “street” rising to the top of the structure and having complete public access – although there would be some commercial activity, like a typical city street. It definitely does not work if it is a privatised system. And yes, fast and slow lift options make sense. Our idea is that the main “tram” would be like a bus that moves vertically and only stops at certain points. Thanks again for the comments. We will be uploading the full report to our website (www.hassellstudio.com) in a few weeks so keep an eye out for it! Warner Quinlan - This is a really big problem with Chinese cities, it’s sad to see China falling into this trap instead of following the much better East Asian urbanization style of South Korea, Japan, and Taiwan with small blocks and narrower streets. A lot of developments are totally out of human scale and to car-centric, it’s partly the reason those so-called ghost cities look so empty.